Did you know that there are around 500 million Tweets sent every single day? That means that, no matter how well-written your Tweet is, there’s a very good chance your audience might simply miss it. And it’s the same with other social networks – it’s getting easier and easier for your posts to get lost in people’s busy news feeds. That’s why it pays to reshare old WordPress content multiple times over its lifespan. 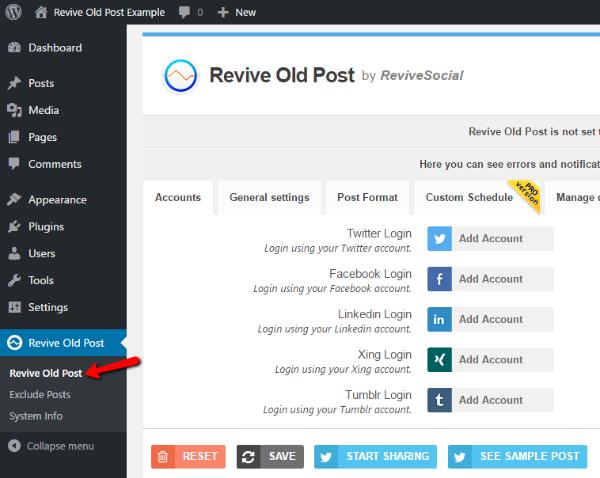 In this post, I’m going to show you exactly how to do that automatically by using a handy plugin called Revive Old Post. It’s free and easy to use. It gets lost in their feed. Or, because many social networks are decreasing the organic reach of posts, it might just never show up in their feed in the first place. They’re located in a different timezone and aren’t online when your first post goes live. Resharing your content can fix both of these problems. You can reshare in your main time zone to give those readers another chance to catch your post in their news feed, and you can also share in different time zones to make it easy for your global readers to see your posts. Another reason you need to reshare content is to reach new potential readers. If your blog is growing, your social audience will grow as well. That means you might have followers today who never had a chance to see your old posts. Resharing content will allow you to reach these new social followers and get them into your back catalog of content. These aren’t just pie-in-the-sky ideas either, Tomasz Tunguz found that reshared content on Twitter still got a significant number of retweets (though there was a dropoff from the first share). If you upgrade to the pro version, you’ll also get custom post types support, the ability to use multiple social accounts, LinkedIn support, custom scheduling, and more. For the purposes of this post, though, I’ll be using the free version. Accounts – link the social accounts you want to automatically share to. General Settings – set details like the minimum time between shares, how old a post should be before resharing, and more. 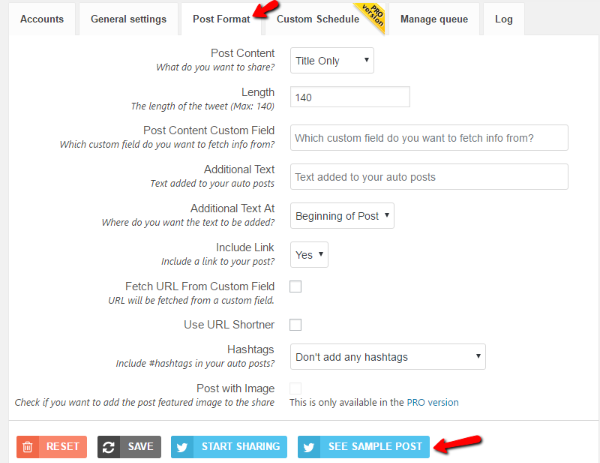 Post Format – choose the format and content to include in your social shares. Custom Schedule (Pro Only) – create a custom schedule for sharing your content. 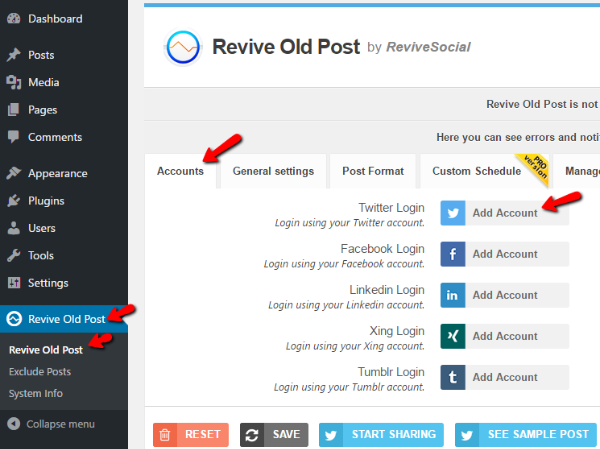 The first thing you’ll want to do after activating Revive Old Post is to link the social accounts you want to use. Minimum interval between shares – specify the minimum amount of time between shares in hours. For example, if you don’t want the plugin to share more than once every four hours, you should enter “4”. Minimum age of post to be eligible for sharing – set the minimum number of days since publishing that must have passed. For example, if you don’t want to reshare a post until it’s two weeks old, enter “14”. Maximum age of post to be eligible for sharing – similarly, set the maximum eligible age of a post. If you don’t want to share posts that are older than 3 months, you should enter “90”. Number of posts to share – set how many posts to include in each share. Leaving this as the default of “1” is probably the best idea. If you want to get more specific, you can also include/exclude categories, select image sizes, and set up analytics tracking. 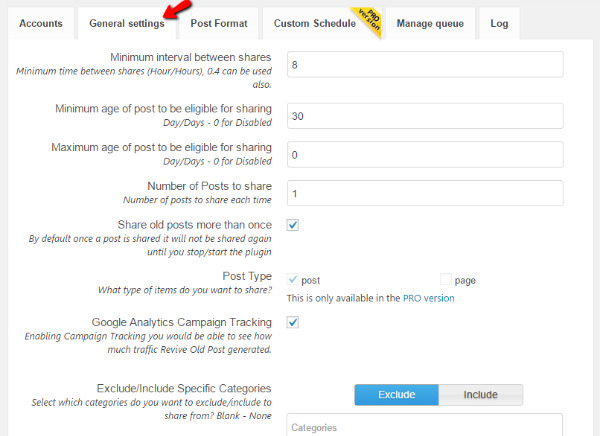 Post Content – choose whether to include content from the title, body, both, or a custom field. Usually, title is the best option here. Post Content Custom Field – this is somewhat advanced, but you can set up a custom field to pull content from. You would then manually enter the share text in each post’s custom field. 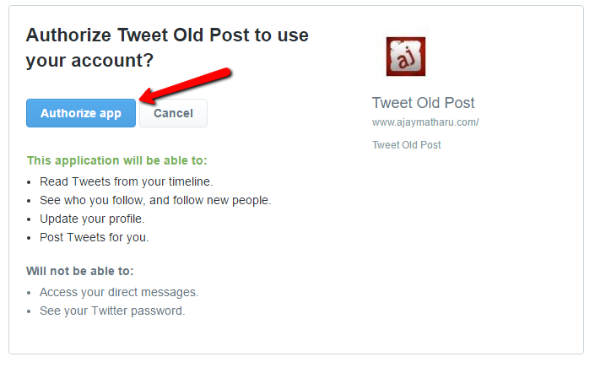 Additional Text – you can input a specific bit of text that you place either at the beginning or end of your posts. URL Settings – configure if you want to include a link in your posts and whether or not you want to use a URL shortener. Hashtags – choose which, if any, hashtags you want to automatically include. Remember, Revive Old Post will share your content according to the rules you set up under General Settings. And if you ever need to exclude an individual post, you just need to navigate to the Exclude Posts option. 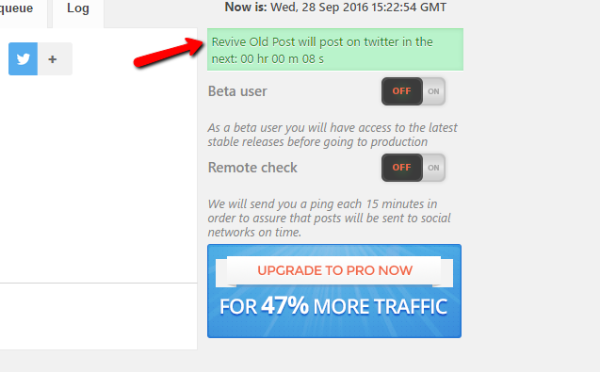 Setting up Revive Old Post should only take you ten or fifteen minutes. And once you’ve got it set up, it will work in the background and continue sharing all your old content. Essentially, unless you ever want to change anything, it’s set it and forget it. With how easy it is to set up, there’s no reason not to start resharing your content. Just remember that reshared content should only be one part of your social strategy. You need to interact with followers and promote your new content, too. Revive old post and it premium version is one of the top products for that work, our there! I caution the use of this plug-in on Twitter. The issue is that Twitter finds this type of tweeting to be to automated and has been “ghosting” people’s accounts who repeat the same tweets too much. If you modify the tweets with different titles and hashtags you will be ok, but regularly sending out the same tweet on an automated schedule is going to get you blacklisted on Twitter. Thanks for the tip Sharon ! !, It’s good to know using automated plugins can create these type of issues. How about Bufferapp ? we use it and schedule the post !! This is great! Is the plug in free and can you use it on the free version of wordpress? Well, if you mean WordPress.com then unfortunately no. This blog covers topics related to WordPress.org which is the self-hosted version of WordPress. Nice article. I am always concerned about plugins slowing down pingdom scores. Any ideas if this plugin drags down page load? If it doesn’t I’ll give it a test drive. Thanks. Thanx to share this i am really need some thing like this. because am doing manually all this stuff. The Premium version is the best one at there we have many tools to get more stability to share our old post at the social network. Re-sharing the old post will definitely work to get more traffic to your blog through social media. Thanks for compiling an article on how to use Revive Old Post. In use this but am finding that while it’s good for twitter, when used for Facebook the shares are now getting no visibility at all. This seems to be since the last FB algorithm update. So, planning to only use on Twitter in future. Does this work for pages as well? or only post? Looks great, can’t wait to try it out. Thanks for sharing. It’s handy, but it depends on the type of content you publish – obviously anything time sensitive will need to be filtered out, or you risk publishing ‘breaking news’ from 12 months ago. You can exclude/include whole categories or individual posts. So you only need to set it once, it will only share what you have specified. Does this work better than NextScripts? I’ve used NextScripts for a while but it’s very buggie and sometimes I get a full list of post ALL at once. That’s probably because of how WordPress Cron works, if you have no activity on your website the scheduled tasks won’t be posted. We do have an option “Remote Check” where we will ping your website often to make sure everything gets shared and the Cron gets triggered. awesome post . i have one question , is there possible to add hash tag , something like when post sharing on twitter , automatically hash tag will be added one selected keyword : like #WordPress . Yes it is. You can automatically add hashtags from Categories, Tags and Custom Fields. So as long as you have ‘WordPress’ as a tag,category, or a custom field then it wil share using that hashtag.